Farm machinery refers to machines collectively used in carrying out farm activities. With the introduction of machinery into farming operations formerly done with human effort are now carried out with mechanical appliances. Common types of farm machinery include the tractor, bulldozer, tillage, machines, planters, lathes, sprayers, motor-saws, harvesters and others. 1. The Tractor This is a powerful motor-vehicle. It essentially consist of petrol or diesel engine, two small front wheels and two large rear wheels. The function of the tractor is that it provides the power used for pulling and lifting agricultural implements such as the ploughs, harrows, drills, sprayers and other heavy equipment. 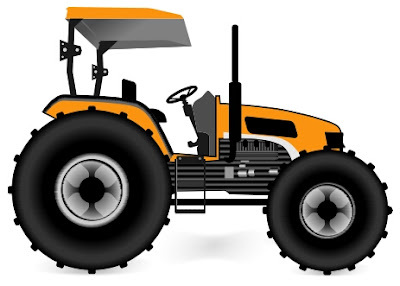 DIAGARM Figure 3.3.2: A tractorhttp://www.clipart.com/en/close-up?o=14336148&memlevel=&a=a&q=Farm%20implements&k_mode=all&s=1&e=20&show=&c=&cid=&findincat=&g=&cc=&page=&k_exc=&pubid=&date=2 . The bulldozer This is a powerful tractor that pushes broad rectangular blade in front. (b) Shifting large quantities of earth. (c) Uprooting large tree stumps, and (d) Removing obstacles such as large stones and logs. Tillage means the working of soils or loosening of soils before seeds are planted. (a) Primary tillage machinery: This refers to the tillage implements that are first used to open or loosen the soil to preparing it to receive seeds. This initial opening of the soil is called primary tillage. The primary tillage implement are the ploughs. (b) Ploughs: The ploughs are primary tillage implements that used initially to break and turn the soil-over in the course preparing it for planting. Ploughs break soil into large clods lumps. The ploughs are of three types. These are the mouldboard plough, chisel plough, and the disc plough. The mouldboard plough among other parts, has the Coulter and share for cutting and mouldboard for inverting the soil. Most importantly, the plough has discs or concave metal blades that cut into the and turn it over. The discs are mounted on frames called disc standards. Typical Disc Plough DIAGRAM Figure 3.3.4: Animal Driven Moldboard Plough. 1. To break down the large soil clods obtained from primary tillage. 4. Produce suitable tilt or soil structure for seeds The secondary tillage machinery includes the harrows, ridgers, cultivators, rotavators and rollers. The harrows consist of dics, or pines that are fitted to a shaft. All the parts rotate as one unit. The implement is hitched or attached to the tractor during farm operation. The ridger is an implement that is used to turn the soil in one direction after ploughing to form ridges. Crops such as yam, cassava and potato can be sown thereafter. There are two major types of ridges. These are the disc ridger and mouldboard ridger. The two ridgers work in the same way. However, the disc ridger 1 is better for use in Nigerian soils. This is because the soil contains obstacles such as stumps, roots and stones. At times the! soils are sticky and disc ridger can effectively work in such conditions without frequent breakdown. The disc ridger consists of opposed concave discs which actually make the ridges. The discs are fitted to mental frame called standard. This is bolted to a bigger frame called beam. The ridger is attached to the tractor during field operation. The mouldboard ridger has features common to the disc ridger. It however has concave or convex blades used to turn the soil in order to form rid»es. DIAGRAM Figure 3.3.5: Disc Ridger. (iii) Cultivator: The cultivator is a secondary tillage implement. It is attached to the tractor during field operation. It consists of several tines used to stir the soil and breakdown soil clods. The cultivator is also used for weed combing, and dragging out stones and tree roots from the soil. The implement can be used for weeding and incorporating fertilizers into the soil after broadcast. (iv) Rotavator: This is also a secondary tillage implement that has set of rotating blades. It breaks up soil clods and farm thrashes are chopped up in the process for easy decomposition. (a) Seed drills: These machines can be operated by tractor or by hand. They drop or plant seeds and in some cases, discharge fertilizer at the same time. Most seed drills plant crops in row. They are set up to plant seeds at appropriate rate and distance. Crops such as maize, rice, wheat, barley, rye. oat and beans can be planted using the drills. DIAGRAM Figure 3.3.6: Seed Drill (Hand Operated). (b) Planters: These are machines designed to plant seeds. Some of them are built to plant one type of seed. Others can plant more than one type of crop. This is achieved by changing the plates. The planter built to plant seeds in rows with enough detail between the stands is referred to as row planter. Some plant are able to plant seeds and distribute fertilizer at the same time The planters can be mounted on a tractor or trailed. This is a machine consists of a small petrol engine, steel blade and chain round the blade. The chain rotates during operation and is the cut edge of the machine. The motor-saw has two handles for handling and positioning during use. (i) It is used in cutting down (felling) trees during farm preparation. (ii) It is used in felling and cutting timber trees into logs. (iii) Also used to split logs into planks. The combine harvester is commonly used in commercial farms for the harvesting of cereals such as rice, maize, wheat, barley As the name suggests, the combine cuts the standing crops, separates the seeds from the chaff, and collects the grains tank while tank while the crop residues are thrown Held. These activities are completed in one operation. The forage harvesters are machines used in cutting forage crops (grasses and legumes) for making silage to be kept for feeding animals during the dry season. The field mowers (weeders) are machines used to cut grasses for hay making. This can take between nine and twenty-three litres of solution. It is usually mounted and pegged to the back of the operator during field operation. This is attached to the tractor during field operation. The sprayer is operated by the power take-off or P.T.O. 3. This type is made of plastic tank for the liquid chemical and uses petrol as Its source power. As in the simple knapsack, the operator i the spray boom to the crops or objects to be sprayed. Spraying with chemicals should not be done during bad weather. The chemicals left after spraying exercise must not be poured in places where they can contaminate vegetables, and drinking water Protective covers should be used by the operator during field operation. Sprayers should be washed, cleaned after use, and a safe place until when needed. DIAGRAM Figure 3.3.7: Knapsack Sprayer. 5. Accessory Tools These are tools which are useful for the effective utilization of farm machines. it is also used for loosening screw. There is also the star-screw driver with multiple or star-like grooves. Nuts are small pieces of metal and screwed onto the end of a bolt. On the other hand, bolts are metal pins with heads. Nuts and bolts are together used for holding parts of machines together or in place. The hammer consists of a thick small metal head and a wooden or metal handle. It is used for knocking in nail and also to beat metals into flat shapes. This is a tool that is used in tightening, re-tightening and loosening deep seated nuts or nuts that cannot be reached with the ordinary spanner or screw driver. This contains oil which is applied to engine parts with the help of its pointed tip. (h) Grease gun: This instrument is used to apply grease into engine parts. It consists of the tank and a long pipe with which the "tease is pumped into inner parts of engines. (b) Mention five advantages and disadvantages of farm mechanization in Nigeria. 2. Discuss five problems that may hinder farm mechanization in Nigeria. 5. (a) Explain the term tillage machinery (b) List two primary and two secondary tillage machinery. 6. (a) Give reasons why secondary tillage is necessary. (b) Briefly explain the importance of the plough inform operation 7. Write short notes on the following: (i) Sprayers (v) Spanners (iii) Seed drills (vi) Alien key (Hi) Harvesters (vii) Pliers (iv) Screw drivers (viii) Nuts and bolts.